SACRAMENTO, Calif. (CN) – California’s planned bullet train, one of the nation’s largest infrastructure projects, just got a lot more expensive and will take years longer to come to fruition. The cost of connecting Los Angeles to San Francisco by high-speed rail spiked 20 percent, ballooning from an estimated $65 billion to $77 billion according to the draft business plan released by the California High-Speed Rail Authority on Friday. Include Phase II of the project – spurs linking Sacramento and San Diego to the network – and the cost soars to $86 billion. Besides more expense, the revised plan acknowledges it will take longer to get the trains running. 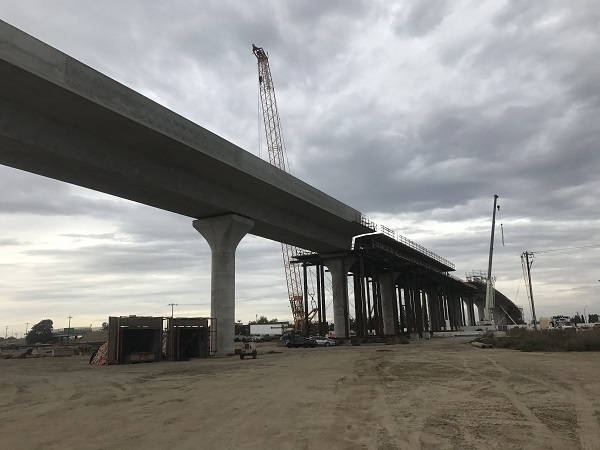 The Central Valley Line connecting Bakersfield to San Jose will not be operational until 2029, while the original plan for trains running from Los Angeles to San Francisco will not be realized until 2033. “Building the nation’s first high-speed rail system, consistent with the will of the California voters, remains a tremendous challenge, but it is achievable if we remain committed to getting this transformative project done,” said Rail Authority CEO Brian Kelly on Friday. While not unexpected after officials in January said the Central Valley segment was running $2 billion over budget, Friday’s announcement stoked the fires of those long critical of the project. GOP leaders at the state and national level have long lobbed invective at the project, characterizing as a boondoggle and a colossal waste of taxpayer money. Kelly maintains a large portion of the projected cost hike is due to price increases on the Central Valley portion of the project. Litigation, right-of-way acquisitions, environmental review and other assorted costs related to securing land for track have driven up costs. Inflation and a larger contingency budget also contributed to the spike, Kelly said. But officials also said they have learned valuable lessons from the actual construction of track in the Central Valley, which they can apply to future segments of the line. Furthermore, they believe the cost estimates as presented in the current plan will hew closer to actuality going forward. “The plan reflects our commitment to apply lessons learned and make organizational improvements necessary to deliver this project,” Kelly said. But Friday’s plan also acknowledges severe funding challenges in the near-term, as the $10 billion voters initially approved for high-speed rail is quickly running out and private investment has been slow to materialize. The authority has also run through $2.5 billion in federal stimulus funds provided by the American Recovery Act. While the Trump administration has sent mixed signals regarding high-speed rail in California and infrastructure projects in general, state officials say they need rely on themselves. “Last year, AB 398 was approved by the Legislature and signed into law by Governor Brown extending the cap-and-trade program through 2030,” Kelly said, adding that it was a significant attempt to secure long-term funding. However, critics point out the money generated annually by the program amounts to an insignificant portion of the overall project costs. The high-speed rail authority releases business plans every two years. The public is encouraged to comment on them as they are released. The comment period for the current plan is open until May 7.